Kofax enables Microsoft Business-Critical SharePoint. Kofax TotalAgility and Microsoft SharePoint® are complementary products. TotalAgility is a Capture Enabled BPMTM suite that enable scustomers to further leverage the functionality within SharePoint to deliver complete end to end BPM and Dynamic Case Management solutions. TotalAgility is a zero-code environment integrating with SharePoint out-of-the-box. As a result SharePoint users, can deploy BPM and Dynamic Case Management solutions quickly without relying on expensive IT code based changes. Customers have the choice of using a TotalAgility generated workspace for their process participants or utilizing a Microsoft web portal. For companies that use SharePoint sites as their primary web portal and productivity space for employees, TotalAgility web parts are customizable web page components that can easily be plugged into an organization’s SharePoint portal. As an alternative to web parts “out-of-the-box” web pages are provided that allow TotalAgility forms to be hosted seamlessly in SharePoint. The TotalAgility product also comes with an “out-of-the-box” Dynamic Case Management site template to use when creating a SharePoint site. As a result Kofax customers can execute BPM and case activities from within their familiar SharePoint workspace. Microsoft® SharePoint® is an integrated solution that delivers enterprise content management, records management, collaboration, and workflow capabilities in a single platform. To get the most out of this platform, organizations need to capture content from many different sources and deliver it directly into SharePoint, quickly and with minimal or no manual processing. Kofax solutions extend SharePoint to handle any capture need, making business critical information available across the enterprise quickly and easily. Kofax captures and delivers all information types, paper and electronic, into Microsoft SharePoint and Office 365. 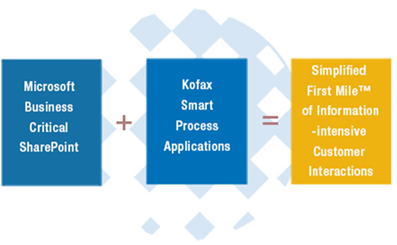 With our touchless processing capabilities, Kofax automatically classifies captured information by document type, extracts information from the documents, converts it into data, and validates the information is correct. This can all be accomplished with little or no manual intervention. The documents and data are then delivered to SharePoint where the information is used to populate column data, and trigger business rules and workflows. Higher accuracy and better information and data improve the accuracy of your downstream business processes. This leads to reduced costs and processing time through touchless processing, fewer errors by lowering or removing manual steps, improved compliance, and reduced risk. It also enables better decision making by harnessing accumulated knowledge and enabling better mining of data and business intelligence, offering greater value to the organization. Once information is securely and accurately delivered to SharePoint, Kofax TotalAgility can then manage the complete business process, automating the entire process from beginning to end. 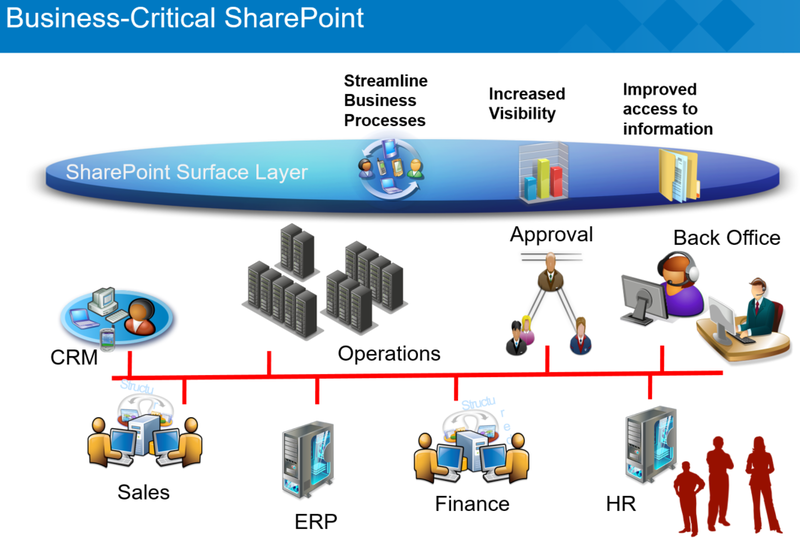 Why not just use Microsoft SharePoint for BPM and Case Management? While Microsoft SharePoint has native support for Windows Workflow Foundation enabling users to deliver simple linear, document centric, processes it is not a true BPM platform. Business processes span many platforms (Microsoft and non-Microsoft) as a result there is a need for process orchestration. Kofax TotalAgility delivers industry leading business process orchestration of both Microsoft and non-Microsoft business applications. Microsoft SharePoint workflows are custom developed. Development can be a code-intensive, expensive process. In addition, it is difficult to re-use workflow components elsewhere leading to inflexibility and lack of agility in the final solution. Kofax TotalAgility empowers the analyst and does not rely on a team of software developers. In addition, any developed workflows can be reused on other business processes. Microsoft SharePoint generated workflows are executable programs and cannot be changed at runtime. The ability to support in-flight process change is a core feature of Kofax TotalAgility. In addition, the software delivers escalation, exception handling, optimization and monitoring tasks which are critical to complex processes and are not supported by Microsoft SharePoint workflows. Finally, building the workflow is only part of the solution. The finished process requires user screens, business rules, integration into third party systems, a configuration management and release mechanism as well as support for testing and upgrade processes. Enables users to deploy BPM and Case Management solutions rapidly. Delivers support for complex business processes. Enables in-flight process change and Dynamic BPM. Equips staff, customers and partners with the ability to interact with business processes using familiar Microsoft SharePoint interfaces. Enables process orchestration between the TotalAgility product, SharePoint, Dynamics® CRM, Lync®, Visio®, Office, Outlook as well as non-Microsoft business applications. Orchestrates business processes across multiple data sources including SharePoint, Dynamics CRM, SQL Server as well as third party and bespoke data sources. Delivers an end-to-end solution; workflow generation, testing, user screens, business rules, 3rd party integration and release management. Allows workflows to be reused on multiple business processes. Create SharePoint sites, folders and sub-folders. Automatically upload a document to a document library in SharePoint. Automatically perform document Check In/Check Out. Add Folder to Document Library. Utilize Unique SharePoint (GUID) Identifiers. Configure and execute TotalAgility actions resulting from SharePoint. For example, the events in SharePoint for which the TotalAgility product actions can be configured include: added, updated, deleted, changed, checked in/out and undo check out. Utilize SharePoint Fault Tolerance within the TotalAgility BPM solution or Case Management solution. Embed the TotalAgility web parts within a SharePoint portal. Available web parts include: Login, Work queue, Create New Job, or Fragment, Complete Activity, Job List, Job Notes and Job Properties. Out-of-the-box web pages are provided, that allow the TotalAgility forms to be hosted seamlessly in SharePoint. Kofax TotalAgility fully integrates with, and extends the Microsoft family of products. The Kofax TotalAgility suite deploys on Microsoft .NET and utilizes industry standards such as BPMN, web services and LDAP to allow users to design, develop, deploy and monitor complex BPM solutions without the need to write any code. Automatic generation of user forms and web parts means the resulting process solutions can be easily deployed within an existing Microsoft environment. Kotax TotalAgility uses a SQL Server database, and utilizes and extends many of the features of the Microsoft family including Microsoft SharePoint, Dynamics CRM, Exchange, Lync, Microsoft Office and Windows 7 mobile. Kofax TotalAgility runs on Windows Server 2008, Microsoft Windows 7, Vista and XP and provides a browser interface which supports all common desktop browsers including Internet Explorer. Other Microsoft products such as Silverlight® and Visio® are used as part of the graphical design environment. Kofax Capture. Accelerates business processes by collecting documents and forms, transforming them into accurate, retrievable information, and delivering it all into Microsoft SharePoint, other business applications and databases. Kofax Transformation Module. Streamlines the transformation of business documents into structured electronic information by automating document classification, separation and data extraction, initiating and feeding transactional processes in Microsoft applications. Kofax Communication Server. Coordinates and performs the automated exchange of information by integrating inbound and outbound communication channels including Microsoft Exchange. Kofax Express. Is an on ramp for SharePoint that makes it easy for anyone at a departmental level to scan, organize and store documents to SharePoint for archiving, records retention and disposition. Kofax TotalAgility. Is a BPM platform & case management system that enables greater organizational agility and significant organizational gains through better management of processes. More efficient, flexible and better executed business processes mean lower costs plus greater and earlier ROI for the organization. Contact us for more information regarding Kofax TotalAgility for Microsoft SharePoint.